The area of the most common words, comes in Mirkwood. Thorin and Company have been starving, the dark and depressing atmosphere weighing them down. [08.057] they all left the path and plunged into the forest together. From there, the differently-angled climbing peak in Mirkwood includes the drawing and naming of Sting, the moment that Bilbo decides to become a hero and lead the spiders away, and his spontaneous poetry! We’re carefully remembering that each point on the graph represents the mid-point of a five-thousand word window – the stream-crossing and the drawing of Sting happen well within a single window whose point is on the sharply rising line. Let’s also keep in mind that the word “spider” is among the uncommon words. I am having fun looking at the specific points, however, and I hope you are as well, Word Fans. Our adventures in Mirkwood are not quite over! 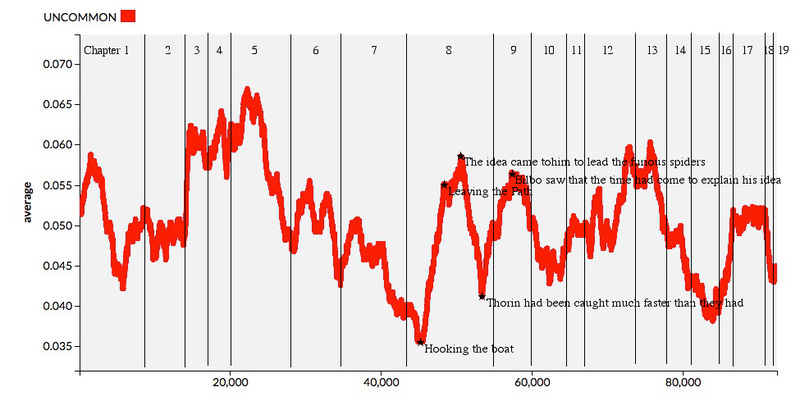 The dip at 53,000 comes a few pages before the end of chapter eight when the company is relieved to have been rescued and the perspective shifts to Thorin’s capture by the Wood-Elves. The peak at 57,000 begins the daring Chapter 9 escape out of the Elvenking’s fortress.